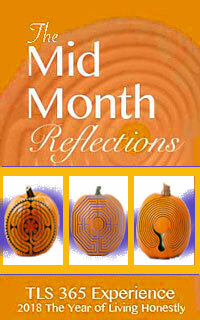 Do you have an individual, group or community in mind as you begin a labyrinth? How do they benefit from your experience? Observe your conscious ways of sharing by thinking of others in your walk today. I have always been drawn to labyrinth but when i lost my husband of 36 years to Esophageal cancer only 6 weeks from diagnosis I was devastated. A friend invited me to a labyrinth walk at here church and I went and found peace for the first time since his loss. 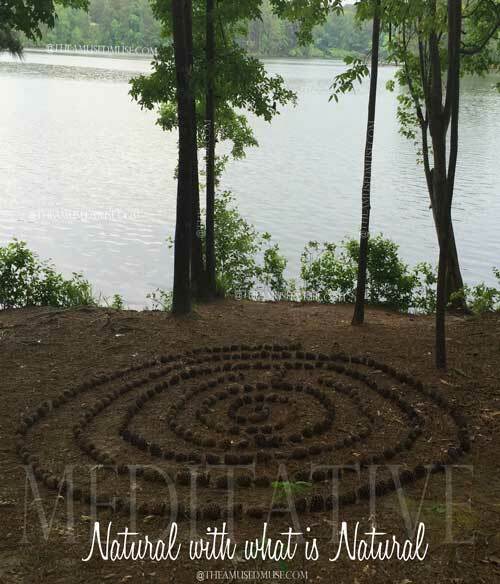 I found that my walking and creating labyrinths I was able to start healing and in my healing I am able to bring labyrinths to others to help them. I have created a 12 foot canvas labyrinth and about 15 lap labyrinths in the last year that I take different places to allow others the chance to experience the life changing powers of the labyrinth. I have been taking my labyrinths to parks, the library and just last week to a Metaphysical shop so people can experience them. 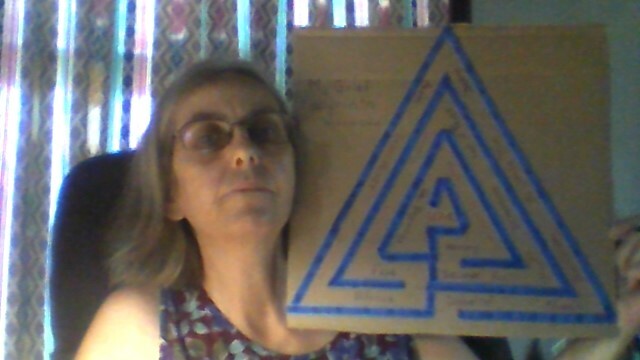 I also will be offering Make Your own Labyrinth classes so others can have a labyrinth at home to use. I am seeing labyrinths in so much of life now. 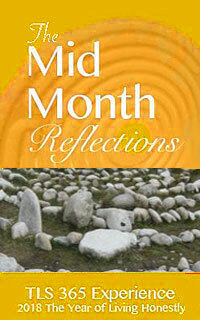 I am learning to look at life as a metaphor and how the labyrinth mirrors that in many ways. I try to get people together at least once a month for a labyrinth walk. Meditation isn’t a great mystery or something that confounds. It is the simple act of being fully available to the task at hand. It is being all in and single purposed in what you are compelled to do. It isn’t sitting and chanting, but it can be. It isn’t a practice, yet it can be to develop and acquaint one’s self with one’s self more proficiently. To be meditative means to surrender anything that isn’t part of what you are doing and being entirely focused. Dancing, painting, writing, creating, and playing are simple forms of being in the meditative space. Being in love can be meditative as we give ourselves wholly into the experience. It isn’t just mindfulness, it is full beingness and when we can be present with everything, we can then begin to understand a fuller capacities. Devoting a time in the day when all else goes away and the footsteps make a light sound to feel the impact of the ground… it is a moment to feel the function of the body and the release of the busy mind to appreciate the feeling and intuitive one. When one can simply fall in love with the experience, the moments become magical and appreciative. Surrender your steps and observe what you fall into along the path way today. Making a design is a great way to walk from inside the design until it is completed. Observe what comes outside of your inside in the walk today. The fun is where we find it. Last month when playing with Mom’s cereal, we had a wonderful time creating a number of labyrinth designs. 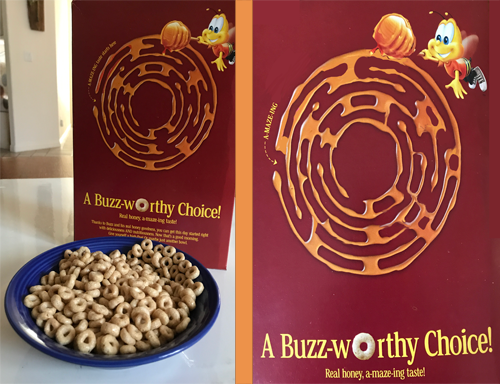 This was inspired by the cereal’s package, which Mom thought was a labyrinth. Time for a little Cheeri-O! Play I Spy today and notice what you can change in your environment to suit your needs with a little amusement. Happy Thanksgiving! 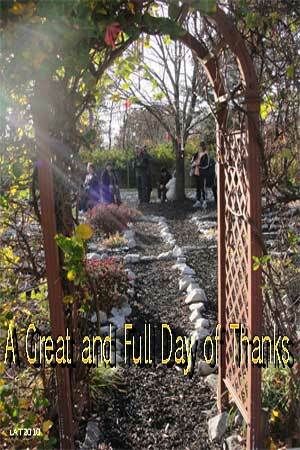 It is a day for thanks and giving to foster the rest of the days to be of similar praise. Each walk is one of gratitude, even when we don’t seem to realize it. Creating, discovering, or finding a familiar path is the first gratitude. Without its being there, we would not walk the path…and we have gratitude. Coming to the walk, arrives in listening to our inner voice and how it calls us to walk. Honoring that is something to be thankful for. 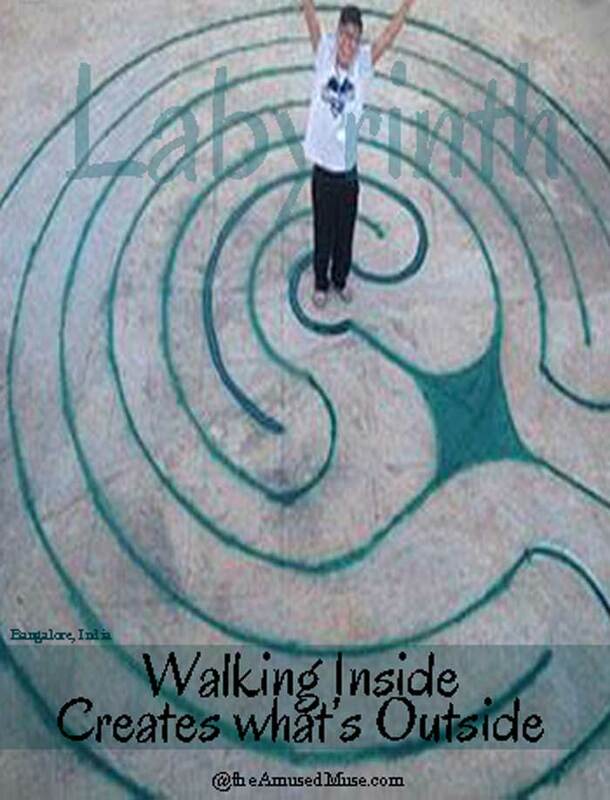 Walking it and allowing for the paths to provide is yet another great and fullness of the labyrinth. Being fast, slow or somewhere in between is our presence on the labyrinth and noticing it is another gift we are appreciative of. Observance itself is a part of our being, though a skill that grows with use and our practice is another gratitude we can enjoy. Completing our walk brings a sense of accomplishment and with that a natural self appreciation too. No matter how you walk, there is a great sense of appreciation, thankfulness and gratitude that accompanies the labyrinth discovered by those who walk and share it. As the world is in constant change and flow, I find the labyrinth a place to accept the flow of my energy as an individual on it, though the labyrinth structure remains the same. It represents the steady and true to our understanding as it sits waiting for use and performs with the same parameters of stillness each time. I am one factor that creates change. The labyrinth doesn’t really change, I do. The others who walk it do the same, bringing their energy to the experience and maybe leaving something behind. It makes me consider who walked before me and who walks after as a result. As everything that is used, shows its wear, the labyrinth change is subtle. The stones may move or roll away, the design may shift, paint can fade and marks appear on its surface. It holds a place for all of us and contains the energy of what we have infused it with. A labyrinth that looks old or care worn, is a labyrinth that has much to tell us.